For at least a hundred years, people connected with Toccoa Falls College have known the Cherokee Indians once walked on the land that now makes up the college’s campus. Many have found arrowheads, beads that were used for trading, and other artifacts. 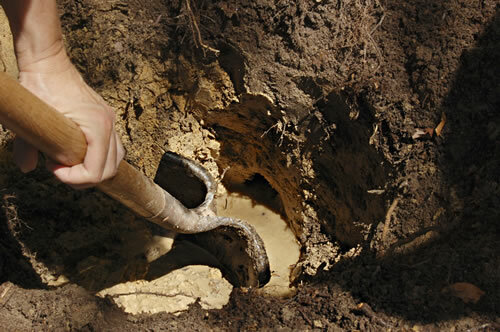 Over the years, we had heard rumors about a natural spring located off the lower road where people once stopped and got a drink of cool, fresh water before continuing on to the falls. 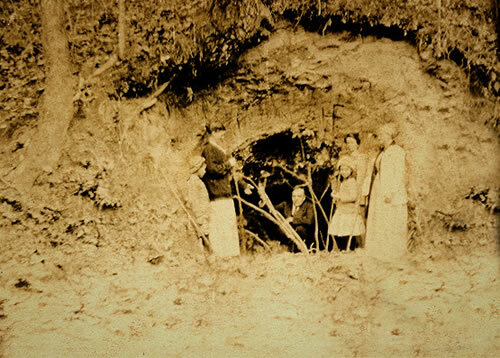 A few years ago before her death, Mrs. Forrest’s niece Betty Rhinehart donated a photograph to the Toccoa Falls College archives that she said was taken at Indian Springs (see larger photo below). The date on the photograph is November 1913—eight months after Haddock Inn burned. She also talked about how the Forrests loved to hike, especially “Aunt Eva” and she recalled how they often walked “to a place at the bend in the road known as Indian Springs. . . . Aunt Eva would just grab her walking stick and off she would go!” Betty Rhinehard was 91 when she died. Recently, several members of the Toccoa Falls College Historical Society met at the spot where Indian Springs was suppose to be located. Ruth Damron, who had played in what was left of the springs when she was a little girl, pointed out where it was located. After digging down about three feet, water began to bubble up—Indian Springs had been located, and its waters began to run free again for the first time in many years. (Left to right) Betty Rhinehart’s brother, Evelyn Forrest, Richard Forrest (stooping in the opening to Indian Springs), Laura Drennen Roseberry (Betty Rhinehart’s mother, who also was Evelyn Forrest’s sister), Betty Roseberry Rhinehart (the young girl), and Olive Drennen, Evelyn’s mother. 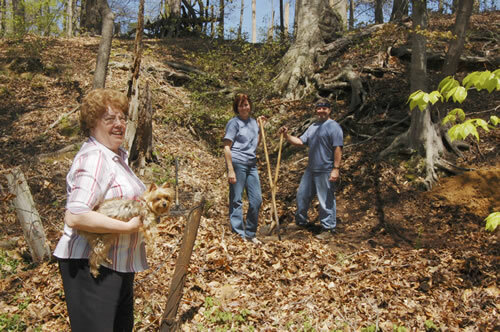 Ruth Damron pinpoints the location of the spring to Angie Ramage and Kelly Vickers. Water bubbles up from the spring. This photo helps us gain the right perspective of the area around the spring. Also, we can see how the springs may have been located a little to the right or how the bank behind the spring has possibly eroded away.